Android provides information for users, developers and partners. Includes press releases, videos, screenshots and downloads. Another Smartphone is joining the KitKat family and this time, the Samsung Galaxy Note 3 Neo Korean variant is the lucky one to get the KitKat treatment. For a reminder, the Galaxy Note 3 Neo is the budget version of the Samsung Galaxy Note 3 and if you don't have enough money to buy the Samsung Galaxy Note 3, you can go for the Galaxy Note 3 Neo. 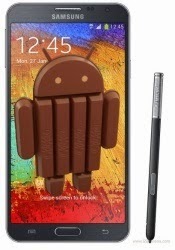 The Android 4.4 KitKat update with a firmware version N750SKSU1BND3 brings many changes to the system of the Korean Samsung Galaxy Note 3 Neo. The new KitKat treatment brings wireless printing support, faster and smoother performance, new camera shortcut, full screen album, this new firmware is more stable, enhanced sound controls and the white notification bar icons. After the KitKat treatment of the Korean Samsung Galaxy Note 3 Neo, we can say that the update will hit other regions too, as currently the update is only rolling out in the Korea. So, stay connected with us to get more on it. If you have already upgraded your Korean Samsung Galaxy Note 3 Neo to the Android 4.4 KitKat, let us know about this new firmware via commenting below.